As long as I have been involved in physical culture, the notion that lifting weights is harmful to young people has prevailed. This idea never made much sense to me. 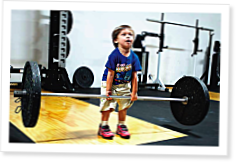 I believe the assumption that lifting weights at an early age is harmful to long-term growth to be completely false. It’s one of those concepts that’s been around for so long no one bothers to challenge it. While just about every authority will say training a very young boy or girl in the weight room is risky, I’ve never come across any scientific data to support the idea—although I’ve read a number of studies done in several European countries that drew the opposite conclusion. While parents forbid their children from participating in a strength routine, they often encourage them to participate in sports that involve a high degree of risk to life and limb. With that in mind, it seems illogical to forbid youngsters to lift weights. What’s more dangerous? Blasting head-on into an opponent at full speed on a football field or power-cleaning a 10 lb. bar in the garage? It’s a no-brainer, yet the old notion prevails. What parents need to understand is that by helping their children get started on some sort of strength-training program, they greatly reduce the odds of them getting seriously hurt when playing any sport. Strength training is a safe activity for people of any age if properly administered. Good article, except I get the impression that posting it in the CFJ is 'preaching to the choir'. Even in medical school, the unsafe viewpoint is standard. It's embarrassing that so many of my fellow students just believe it because that is what they've heard for so many years, despite our school's continual push for evidence-based medicine. And when I ask how weightlifting is harder on the knees than rugby, football or soccer, they claim - with no biomechanical background - that the forces on the joint are greater with weights. Those that do agree with me, settle that kids can do 3 sets of 10-12 reps, but never go heavy. Hey, it's a start! The rest are the same people that are going to end up with all the risk factors we (med students) learn about everyday....and then watch their kids inherit the lazy gene. Awesome article, Coach Starr! You have it correct. I have 3 stepkids and they are just now getting into Crossfit, and habits that will keep them healthy for a lifetime. The youngest one loves lifting and rowing. How could I not let her lift, yet tell her full-speed soccer is a-ok? Great article! Do you happen to have any of the citations for the European studies that support weight lifting at a young age? I am curious to see how they structured their programs and the ages and backgrounds of the young athletes. Thanks! I appreciate this article very much. I do have one minor criticism though (which actually is directed as much to the editors as the author). When studies are cited the interested reader needs references in order to assess the validity of the conclusions of the author. The fact that the studies originate somewhere in Europe does not give them any added credibility. (For the record: Europe is not a country, but a continent of about 50 very different countries with extremely rich and varied histories, cultures and traditions that span several thousand years. Describing a study as European says almost nothing about it). Therefore, I'll echo Andrew Beck's request and expand it: Please add a reference list to articles when studies are cited. I couldn't agree with you more Leifur. I like showing the CFJ to friends and encouraging them to participate in CrossFit. It makes a lot of sense to me. We should all be doing it. However if the CFJ purports to be the authority in elite fitness that it is, accurate referencing should be a minimum requirement. It adds to the depth of the article and gives you the opportunity to look at other sources rather than just accepting the authors findings as fact. Wish this was a free download! This would be a great article to hang on our website to reinforce the CF Kids program we have and to pass along to parents who doubt what we're doing for their kids. These may not be the exact studies Mr. Starr referred to, but they will give you a starting point as to academic research on strength training and youths. They come courtesy of Dr. Lon Kilgore, who cited them in the document "Misconceptions About Training Youth: Knowledge to Share With Parents and Administrators" (2005, The Aasgaard Company). Singer, R.N. (1970). Motor learning and Human Performance: An Application to Physical Education Skills. Macmillan Company, London. Theintz, G. et. al. (1994). The child, growth and high-level sports. Schweiz. Z. Med. Traumatol. 4(3): 7-15. Cahill, B.R. and E.H. Griffith (1978). Effect of pre-season conditioning on the incidence and severity of high school football knee injuries. Am. J. Sports Med. 6: 180-184. Mersch, F. and H. Stoboy (1989). Strength training and muscle hypertrophy in children. In: S. Oseid and K-H Carlsen (Eds.). Children and Exercise XIII. Human Kinetics, Champaign, IL. Pierce, K. et. al. (1999). Youth Weightlifting – Is it safe? Weightlifting USA 17(4): 5. I just want to add another vote of support for the idea that CFJ editors should enforce more strict standards when it comes to referencing. That is what an editors board is for and would give the journal more credibility. I consider the CFJ an excellent source of fitness information, but as someone working in the academic setting it has been a bit frustrating to read articles with absolutely no references to back up their (often controversial) claims. I often agree with the claims but trying to explain it to someone else (like Adrian said) makes me sound like that annoying friend/family member who always talks about the latest benefits/dangers of foods they saw on the local news. We actually have a little joke in the lab that whenever you know something is right but you can't remember why, you just say "Well this effect was shown by a European group a few years ago, but I can't remember the name." That was all I could think about when I read the article. Good article. Question. If kids are lifting weights, should they concentrate more on technique and reps as to lifting max weight? Thank you. Not a good article, a great article. Technique first both for kids, as well as adults. Many CF Kids affiliates have found it useful when presenting weightlifting to parents. We are also working on a revision to the CrossFit Kids Magazine article, due out in early 2010. In the meantime, you should find helpful these policy statements that came out in the past year and a half since the article was published. All extremely positive regarding this topic. Sports Biomechanics Journal, VOL 2(1) published by the Department of Kinesiology and Health Sciences and USA Weightlifting Development Center, Louisiana State University, Shreveport 71115 and the Willis Knighton Medical Center Spine Program, Shreveport LA. if you have the means. This group of researchers conducted a study of boys and girls and the effects of weight training. There is countless up-to-date research on this data however, in 1983, the American Academy of Pediatrics had the position of deterring weightlifting in children. That was more than 20 years ago. People are using this data as the source of "they say weightlifting is bad for kids". The above study was published in 2003. I feel that people do not want to train children due to this stigma. The children in this study, of course with proper technique (the fundamentals for all lifters) were lifting their body weight. I have done my own research on this subject and feel very comfortable putting my 12 year old son under the rack. I agree that children get hurt more playing traditional sports and I also feel that they are not properly trained to do so before their parents slap some padding on them and throw them out there. LIkewise, parents love the concept of providing sugary snacks and drinks during practice, games, etc. Being a former Soccer Mom, I would never allow my kids to eat that crap. By instilling the value of training for sport in our children, we may ultimately reduce non-impact injuries. Children's bodies respond similarly to exercise as adults; the differences are physiological, their temperature regulating mechanisms are not fully developed, etc. However, the does not mean that we should avoid something that will ultimately benefit them (frequent water breaks and cool down periods are a must). The affects of strength and resistance training that we are starting to see in women over 30, the elderly, and the concept of "Exercise is Medicine" should not exclude children. The European Journal of Sports medicine and the European Nutritional Journals are probably where these articles are coming from. There are a plethora of positive research in the realm of resistance training and children. A leading researcher in this area is Dr. Avery Faigenbaum at the College of New Jersey. If anyone is interested in this area his literature should be on the top of your list. He literally wrote the book on this topic. In addition, if you get a chance to hear him speak on the subject, it is very worthwhile.